First , thank you for the body of knowledge already here . It wasn't until I needed specific help that I had to post . I finally found a decent mic element in an Astatic from an old Pace "teardrop" with excellent sensitivity but still lacking low frequency response . I'm looking at the PC-080 Generator board - Annotated.jpg . Specifically in the area of Q505 and Q506 , the TA7063P op amp and 2SC372Y respectively . I must have forgotten all I ever knew about R/C @ audio frequencies because altering the input network , C526-C529 / R547 , R549 , R550 has had demoralizing effects at worst and no effect at best . I have changed R551 to 15K and C532 to a 10uf@25V to get a bit more gain but it seems at the expense of low end frequency response . Here is the issue . near zero frequency response up to 1800 then the normal filter rool off around 2600 then near brick wall at 2800. The Tempo absolutely hated Low-Z mic input of any kind rewarding that effort with gargle , and hum. I now have great punch and able to over come the alc at will but the bottom end frequency response is missing completely . I'd like to make this adjustment withing the radio and hopefully at the input of the TA7063P. Trouble is I'm at the limits of my R/C audio filter understanding . "Brother could you spare the time ?" Neglected to mention . Its a Tempo 2020 (Uiden) . 2, Has this rig been worked on before? 4. 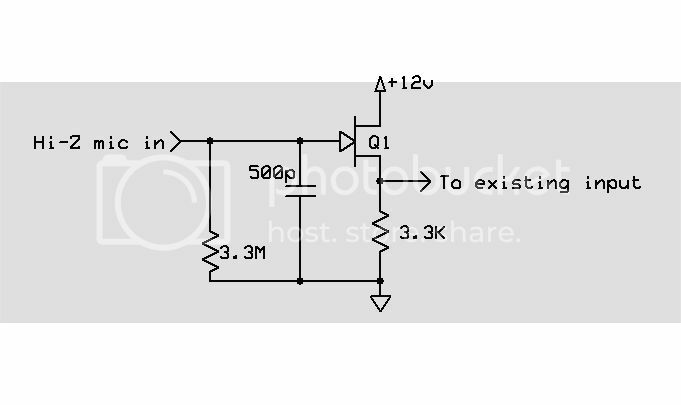 C527, 528, 529 and 536 are all RF shunt caps so don't mess with those and don't change any resistances that might affect dc bias. I would think the internal gains are set so the various internal filters don't get overloaded. Then I would not mention any political figures. The input Z of the audio amp is 120k. Plus 4.7k in series as shown on that schematic. That's not enough for an xtal element. I looked at the schematics in the manual, and it appears the audio in from the mic jack feeds that board directly: no. Preamp ahead of it. Try putting 2 to 5 megohm in series with each side of the microphone element. You stated it was an Astatic style element. They want to see a LOT more R than the typical 50K 'hi impedance transistor' circuits. Or a MPF102 source follower in either the mic or the input of the radio. Those xtal elements need 1 megohm or better. Even putting a single resistor of 1 to 4 megohm in series with the audio lead would no doubt help bottom end rolling off..... If the radio has enough audio gain to start with. Get the input Z matching the element first, before playing with the radio roll off, etc. 1. Looking at the TD7063's internal circuitry, the input resistance as it now stands is 90k, which would be ok for a 10k to 50k dynamic microphone, since you want a minimum 2 to 10X load on the mic. 2. The best he can hope for is to increase the feedback resistance of R548 to 150k which will raise the gain and increase the input resistance to 130k, and increase the coupling cap values to lower the -3dB point. 3. If he is using a ceramic or crystal mic element with an output impedance of > 2.5 Meg, substituting R547 with say a 680k to 1 Meg will increase the bass response but reduce the input voltage to the amp to 0.15X(Vmic-output) or so, since we would be creating a voltage divider, and swamping any gain achieved by increasing R548. So a high output dynamic mic with an output impedance of 50k seems to be the only solution for item 2. The solution for item 3, as you mention, is to build a source follower impedance transformation stage with a FET. Better fidelity means better communication. To get good quality audio out of this rig, the best and easiest way in my opinion is to disconnect the (turquoise in the schematic) audio feed lead off of the emitter of Q506 and instead feed the modulators with an external high fidelity audio chain, driving them directly and bypassing the internal preamps. That external audio chain could consist of an inexpensive studio mic feeding a low-cost mixer/EQ combo, and optionally that could be followed by an equalizer and compressor/peak limiter for automatic control of modulation levels. Adding a JFET Source follower at the input to the card would be the simplest solution to reduce the MIC source impedance, I'd think. The Hi-Z mic simply can't drive the low impedance of the radio's input at the low frequencies, and probably doesn't do very well at the higher freqs as well. This is basically what I did for the station mic input amplifier here using a D104 element. I then drive whatever the current rig is through additional amplifiers. The FET source would be directly coupled rite to the existing input network and since the output level of the crystal mics is so much greater than typical dynamics, no further amplification would be necessary. Thank You All ! I have all I need save for the time . I promise to get back to this with results . I mean I can't be the only one out here with a Tempo ? Upon looking at this problem again, and with the radios I've used, you may want to put a pot between the source follower and the radio input. The mic gain is AFTER the 1st l of amplification. Probably a reason why the other mic you tried was muffled and muddy: over driving the input circuit. I know, wide open on a 8 volt supply, my J310 source follower will overdrive my ts440 like crazy. I got the 8010 wired to the 2020 and it works w/o modification. I made the 12 pin molex cable and it worked first time! Even though the VFO is essentially identical to the one in the radio it is far less prone to drift. I'll attribute this to the lack of temperature variance until I know different. Having a bit of an issue with the radio now. It tunes and operates CW just past 100 watts but SSB falls far short of that, on the order of 35-40 watts. I did modify the audio circuit. The data sheet uses a 22k ohm feedback resistor . The bit in the radio was a 6.8K ohm . I installed a 15k ohm and replaced the 4.7uf output cap with a 10uf. It may just be the microphone. Thing is I have enough audio gain now that the radio hears a pin drop across the room but can not push the output past 45 watts on any band. Turning the audio up any further results in feedback. I've tried several microphones and types of elements with the same results. Tubes are verified as good in my TS-830S seeing as much as 70 watt voice peaks and tuning to 115 watts in CW. I can't seem to pin this one down. A little humbling as I basically brought this one back from the dead and know nearly every circuit. It looks like the output of Q1001 is tied to the Bias of all things with no other adjustment ! For diagnostic purposes the anode of D362 has been lifted. 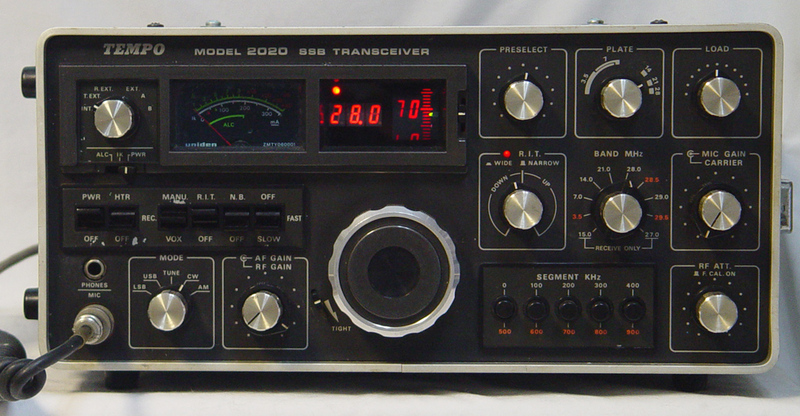 Now SSB operation is normal although the possibility of overdrive via enthusiastic mic gain is possible. Having swapped out the TA7063P feedback resistor (6.8K) for a 15K makes this a little bit touchy. I'm sure this is not as the radio was intended to be used and some ALC is better than none, or too much which started this investigation. I can't help but think I'm missing something obvious . One thing that could cause both issues (audio response and lack of SSB power): the carrier oscillator has drifted in frequency such that it's placing the modulated audio outside the bandpass of the crystal filter. This would also place a fair amount of the audio spectrum outside the bandpass, resulting in poor audio AND low power output. If the carrier oscillator has a trimmer cap, adjust it while belting some "HOLA HOLA"s into the mike and see if you can improve it. FCC: "The record is devoid of a demonstrated nexus between Morse code proficiency and on-the-air conduct." So back to the Tempo 2020 and a temporary disconnect of the ALC. I have output , quite a bit actually. I tried the source follower. Didn't even need to build one. I had one stashed away from my Tempo one days. The audio input ignored it unless the internal ALC had been disabled. As a comparison my TS-830S tunes to nearly the identical output as the Tempo on the same band. The Kenwood easily makes 65 Watt peaks. Near screaming into the Tempo yields maybe 35 Watts unless the ALC is disabled. Now with the ALC disabled a pronounced 120 cycle hum is present on the transmit audio. Possible a cap has dried up, causing alc loop issues?